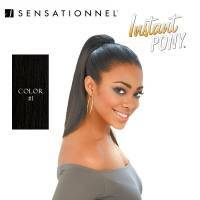 Sensationnel offers an expansive updo collection under the banner of Instant Pony. From jerry curls to soft waves and silky smooth strands, all clip-on-and-go ponytail styles have been designed with a bespoke large cap for comfort and speedy application. Recommendations: Customers can spin their Instant Pony into a trendy bun style for double the styling fun.